While Joan Miro was in Paris, he met with Picasso, whose mother he had already visited in Barcelona to see her son's pictures there. 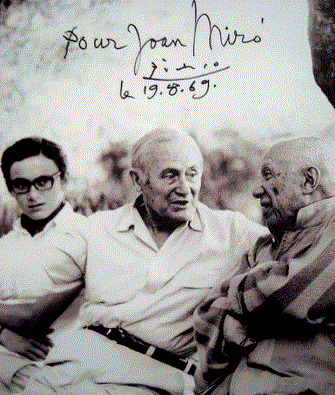 Picasso was friendly towards him and supllied him with some introductions. As Miro recalled:"In the beginning Picasso naturally reserved with me - lately now, after having seen my work, very effusive; hours of conversation in his studio, very frequently"
After the initial wave of awe, Miro was able to recover his balance and observe the Paris art world with a critical eye. He recognized that a lot of contemporary painting was being done for sale and not as the necessary expression of some imminent idea. The idealist and moralist Miro, who had little money himself, became somewhat disgusted. In a letter that reveals his own high expectations of himself, as well as his religious reference point, he wrote, "I have seen exhibitions of moderns. The French are asleep. Rosenberg Exhibition. Works by Picasso and Charlot. Picasso very fine, very sensitive, a great painter. The visit to his studio made my spirit sink. Everything is done for his dealer, for the money. A visit to Picasso is like visiting a ballerina with a number of lovers... In other places I saw paintings by Marquet and Henri Matisse; there are some that are very lovely, but they do a lot just for the sake of doing them, only for dealers and the money. In the galleries you see a lot of senseless junk..."
In July of 1920, Miro was back on the farm in Montriog, and began to work to work inspired by the jolts he had received in Paris. The two painters were in regular contact. Picasso, who pushed dealers and collectors in Miro's direction, was always eager to see Miro's latest pictures, and delighted him by saying that their work had things in common because 'we inhabit the same world'.